The infomercial for the Dermal Tone facial exerciser aired at the turn of the millienium in 2000. DermalTone works on the premise that shooting electrodes directly into your face muscles is the key to looking young. Dermal Tone is like Rejuvenique with the mask taken off. DermalTone is a handheld device that looks like a stun gun; because there is no mask, all the world is able to witness the involuntary convulsions of the face muscles. 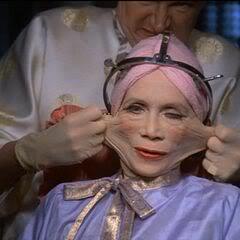 Dermal Tone finally gives us all the ability to control someone else’s face muscles like a marionette’s. Thank you Dermal Tone. When they first introduce Dermal Tone creator Ashley Vann, they make a big deal out of the fact that she is really…40-years-old! I think we can all agree that after 10 years of personally using DermalTone, Ms. Vann could easily pass for 39 in dim lighting. I love whenever an infomercial starts talking trash about competing products that are also advertised on infomercials. Here host Lola Davis calls out both the Facial Flex mouth exerciser and the Rejuvenique electrical toning mask. I have not been able to verify rumors that this dissing of Rejuvenique and Facial Flex provoked a drive-by shooting at DermalTone headquarters. Finally, check out the “commercial” segment of the Dermal Tone infomercial that features hokey graphics that looked dated even 10 years ago. I have misplaced my instruction manual. They look like stroke victims. As corny and ridiculous as that infomercial was…the Dermal Tone actually works. It made a huge difference in my skin. You can get zapped a bit if you’re not wearing enough gel, but other than that it’s fine. I’ve been using this for years and it DOES WORK. The results are amazing. Can you give me an idea of your routine. I have the device, but I lost the instructions. Basically need to know max minutes for each area along with max intensity for each. Thanks. i would like to order a dermal-tone facial exericiser the one like a stungun please tell me how to order it. I have used the product for years and love it. I recently moved and lost the instructions. Could you please email me the instructions. I have misplaced my instructions during the course of a move and furniture etc going into storage. I would really appreciate a copy of the diagramed instructions that show you where to place the unit for maximum results. I love my unit and want to start using it as soon as possible but want to do it correctly. why on earth did they take Dermal-Tone Facial Exerciser off the market and why can’t anybody make one that is comparable!!! Are they all too stupid to realize this was the very best product ever!!! I am also looking for the instructions on the Dermal-Tone which I have misplaced. Where can I find the instructions? How do I purchase the dermal tone facial electrode exersicer ? I’ve had one since the 90’s. Still using it. I don’t know how my face would have looked without it (had some years I slacked off) but I think I look pretty good for 64. Not selling mine but I’ve seen them on eBay for around $150. The Dermal Tone product destroyed my face years ago and gave me nerve damage and I spend thousands of dollars trying to keep my face from deteriorating. I just had yet more Sculptra Injected yesterday. I went from a healthy face to in need of constant doctor treatments. I tried to contact this company many times and they could not have cared less. It redistributed my fatty tissues and I have rapid deterioration of my tissues. It is a nightmare and constant nerve pain! !